Each year for the past seven years, ACT has recognized exceptional individuals across the country who support its mission of helping people achieve education and workplace success. The ACT College and Career Readiness Champions (CCRC) initiative celebrates high school seniors; K-12, postsecondary, and workforce professionals—from all 50 states and the District of Columbia—who are positively impacting their communities and advancing college and career readiness for all. 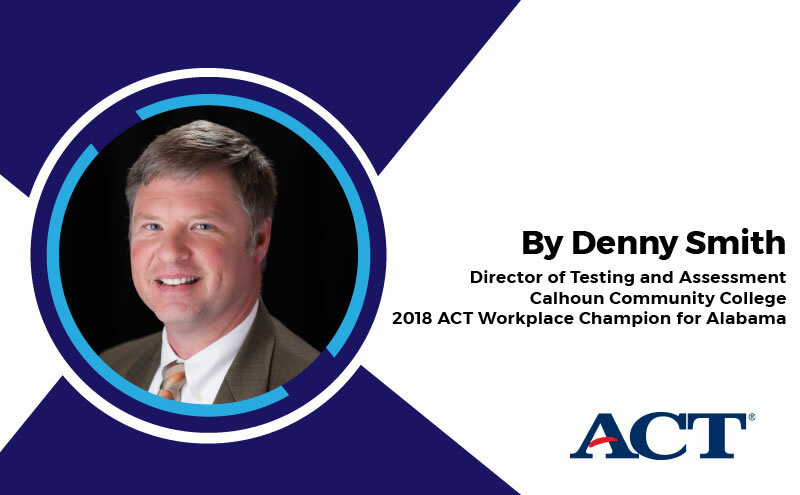 My institution, Calhoun Community College, lead a statewide implementation to test law enforcement officers’ basic skills, using the ACT® WorkKeys® test as an underlying framework for the Basic Abilities Test (BAT), which assesses law enforcement officers on basic skills. The program has received statewide recognition from the CCRC initiative, and BAT and the ACT® WorkKeys® National Career Readiness Certificate® (NCRC®) have gained positive exposure, increasing opportunities for more Alabamians interested in a career in law enforcement. Being nominated as an ACT Workforce Champion has allowed us to spotlight the NCRC in our state and provide best practices to others hoping to obtain and utilize this portable credential. Everyone can benefit from taking ACT WorkKeys and earning an NCRC. I often hear people say that WorkKeys is only relevant to those in manufacturing, but our program for law enforcement officers is proof that WorkKeys can and does affect many other sectors besides traditional manufacturing. Our Champion designation increased statewide exposure to the BAT program and Calhoun Community College, opening up new opportunities and fostering stronger connections within the community, which would not have been possible otherwise. I would encourage all individuals, colleges and employers that have a program to share with others to participate in this initiative. Students must self-nominate, but all other categories can be nominated by fellow colleagues and community members. Click here to apply or nominate a Champion.